But today, I’m going to tell you something you probably don’t know. Once upon a time, in a far away place that many people like to call “college” I had no idea that I was going to someday work in the web design world. Nay, I actually wanted to follow another passion of mine: radio. I have plenty of memories from my days at the radio station, but some of the best ones are my time as the host of The Local Show, a show entirely dedicated to aspiring musicians in the south Florida area. I’m asking you to walk with me down memory lane for a moment so you can understand where my passion for music comes from. Working at Radio X allowed me to expand my musical tastes and exposed me to many different genres and musicians. But that was a long time ago, and since I graduated and stopped working at Radio X, my thirst for new music genres and artists was insatiable. That was until, of course, I discovered Spotify. In this week’s post, I’m going to talk a bit about Spotify, their design, and their latest project – The 2013 Year in Review. Spotify is basically a service that streams music. They started as a Swedish startup in October 2008 and now have over 24 million active users, with over 6 million as paying subscribers. What makes Spotify great is that you have instant access to over 20 million songs. 20 million! I know what you’re thinking – what about Pandora? Sorry Pandora, since Spotify gives me the freedom to choose any song I want to listen to at any given time, Spotify wins in my book. For those times where I don’t have the time or patience to choose each song, I can also listen to Spotify radio, follow other users’ playlists, create my own playlist, or even listen to a playlist compiled solely of music I’ve favorited over time. It sounds too good to be true, right? Well, I suppose it sort of is. The free version of Spotify is really only for your desktop/laptop. If you want to have the full-feature, ad-free version, you’ll have to pay a monthly fee of $10. For me, $10 is well worth it to have the entire musical universe at my fingertips, complete with beautiful design and excellent usability. As I mentioned above, Spotify allows the user to choose what music he or she would like to listen to at (nearly) any given moment. This, in itself, is excellent usability. Give the user what they want when they want it. In addition, Spotify’s user interface is really excellent, and the Spotify team shows no sign of stopping any time soon. Updates to the interface are frequent, but not annoying, and the Spotify team does an excellent job of suggesting new music, informing you as to what your friends are listening to, and notifying you when an artist you like is coming to a venue near you. While Spotify can really market to anyone with a pair of working ears, their target audience seems to be users age 18-24. With this in mind, Spotify has created a youthful, fun brand personality that Generation Y-ers just love. In Spotify’s 2013 Year in Review, the language is short, relatable, and entertaining. My favorite example is in the “Spotify Moments” section, where Spotify demonstrates how certain songs and playlists fit into their everyday users’ lives. This section suggests everything from Monday morning playlists, great road trip songs, and workout mixes to the “best hangover cure” album. While I don’t condone drinking irresponsibly, you have to hand it to Spotify for taking risks like this to relate to their target audience. As with any good marketing strategy, you need to end with a call to action for your user. 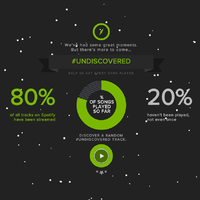 For Spotify, the call to action is to discover a random track. If you click the play button, you’ll be taken to sign in to/sign up for Spotify and then you’ll be shown the #undiscovered playlist. This playlist consists of songs that haven’t been played yet on Spotify. As a music lover, I really appreciate what Spotify has done here. Rather than asking its users to tweet or share the year in review on Facebook, they are asking users to discover a new artist and support their mission. I would definitely like to encourage you to check out Spotify’s 2013 Year in Review, and discover a new artist. If it turns out to be a new favorite, be sure to let us know in the comments section below! I’ve compiled a brief list of things we can learn from Spotify this year, in the hopes that it inspires your 2014 design work! 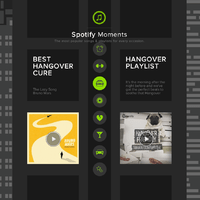 Because Spotify knows their target audience, they are able to create great content for their users. In addition, knowing their audience helps to craft a brand personality that makes sense. I’m not suggesting that you do anything completely crazy, but every so often, take a chance with your design work. You may work for the stuffiest company in the world, but if you find something that most of your users have in common and use that to portray information in a creative way, the reward is great. Although this may seem counter to rule #2, it really isn’t. By “be consistent” I mean with your branding. Make sure you consistently use your logo, brand colors, etc. throughout all collateral. Spotify released their Year in Review weeks ago, and I’m willing to bet this wasn’t a last minute project. Occasions like New Years, Valentine’s Day, Thanksgiving, etc. occur at the same time every year, so there really is no excuse to not be prepared. If you sell a product that is really great for women, perhaps it would make sense to run a special before Mother’s Day. In the year 2014, Mother’s Day will be May 11, which means you should have a concept and plan in place before April even begins. At the beginning of 2014, I’d suggest taking a look at your calendar and marking all possible specials/coupons that you can do in relation to upcoming holidays. Give yourself plenty of time; think ahead and staying current will be a breeze! Before Spotify, users were restricted to the music they could listen to by time as well as money. By understanding this problem, Spotify created a platform where users could pay a reasonable amount for nearly unlimited music and music suggestions. In my opinion, the absolute worst problem a designer can face is stagnancy. There is always more to learn and always ways we can improve. Our clients depend on us to offer creative solutions for their problems. If we don’t continue to learn, experiment, test, and grow, we will never be able to reach our full potential. In the year 2014, I challenge you to keep improving and growing as a professional. 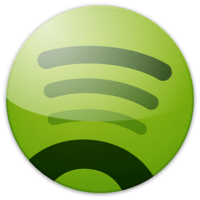 There are many examples of great product and great content on the web, and this week’s article paid homage to one of my favorites – Spotify. I am (obviously) a big fan of Spotify, their mission, and their design work. However, the most important trait that I believe the Spotify team brings to the table is their endless journey for improvement. This week’s post is meant to inspire you in the new year and to motivate you to produce even better work then you have in the past. Looking for a designer who never quits? Contact Optimum7 for a free consultation today.